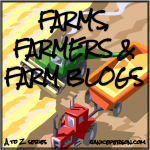 You may want to refresh that cup of coffee before you sit down to read today’s post for the letter T in the farms A to Z cause today there is a lot to take in. Part of it seems to be a true excitement to share what’s happening with farms in the northeast. I doubt anyone has been more enthusiastic about the farms a to z series than Jenni Tilton-Flood aka The Deere Milkmaid. Jenni is part of the Flood Brothers Farm in Clinton, Maine. She’s given me a great bit of insight on their farm too! I go by many names including The Deere Milkmaid, but a lot of folks know me as Jenni Tilton-Flood. I was born & raised the daughter of the John Deere salesman and when I married The Farmer I became part of his family farm (and he got convenient home delivery of his tractor & equipment parts). 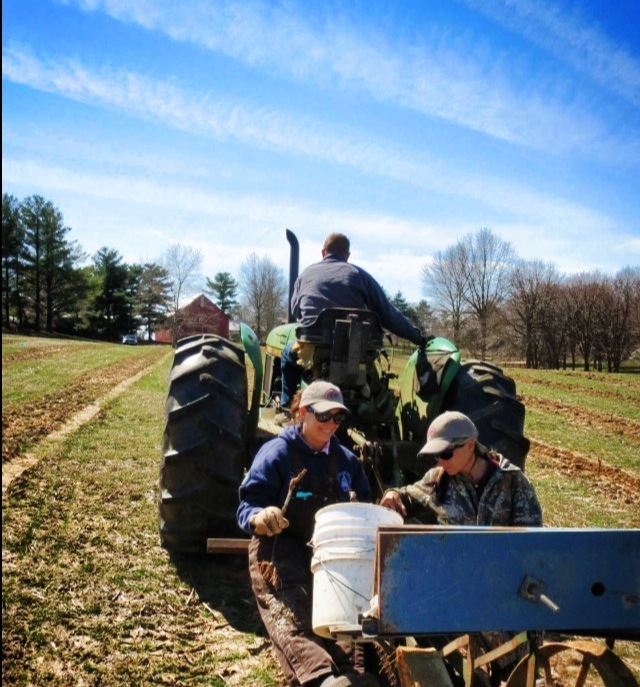 Our family farm, Flood Brothers Farm, LLC has been in the family for over 200 years and we grow the corn and grass that feeds our dairy cows, produce fresh, local milk and raise the next generation of farmers and kids here with 3 generations working side by side. Our family farm cares for 3,400 dairy cows & calves and milks 1,600 of them every day producing 17,000 gallons of milk a day. To keep our animals well fed we raise 1,800 acres of corn and 3,000 acres of grass & hay. We are not just proud of our stewardship of the land and animals but we are proud to be Cabot Farmers and Agri-Mark Coop members/owners. And even prouder that our milk is on our neighbors’ tables. Every farm is unique, just like every family is…our family farm, on the surface and at first glance, may seem quite large (for New England) but if you give it a second look, or if you hang out in the parlor, the field, or even the farmyard, you will notice that we have 3 generations of family here: 6 families and 22 family members from toddlers to a few well beyond the age of retirement (farmers NEVER retire). 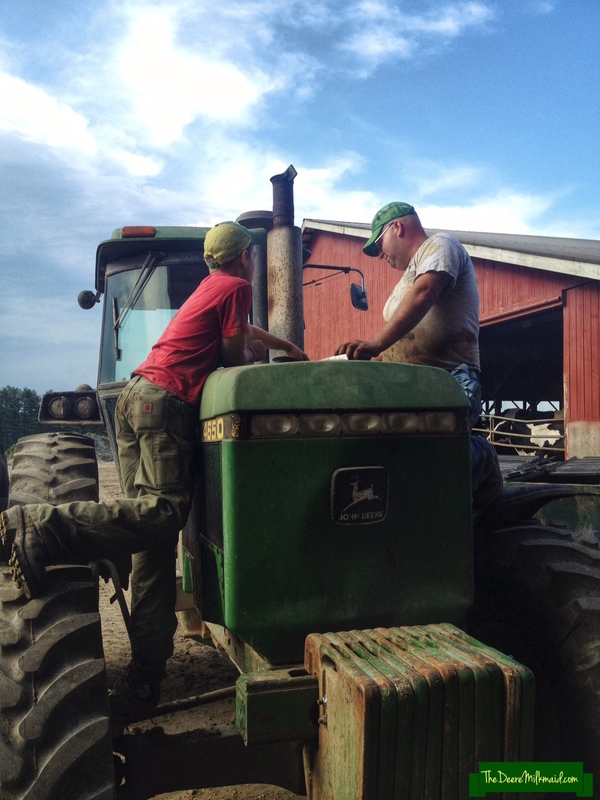 From a 3 year old in the parlor helping his mom, dad and granddad milk to the 14 year old driving dump cart alongside his grandmother’s chopper to the 17 year old young man working before school with his dad we are, in every manner and meaning of the words, a family farm. Family working side by side and generations leading generations isn’t unique for a farm but it’s not what one would expect on our farm if they didn’t take the time to take a look and if, instead, they looked at the numbers and the stereotypes and mis-information that others would have them believe about large farms. What makes us unique is that we put “family” in the “family farm”despite being a large farm… but really, we’re not unique at all, we’re just like 98% of all the farms in the U.S, we just don’t fit into that label so many would have us wear. 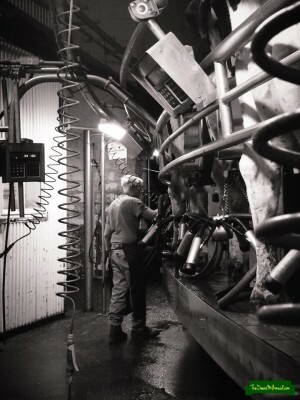 The best thing about farming is that our way of life – our special, close to the Earth, hard from the start but rewarding in every way, hardly ever the easiest but rarely anything less than the sweetest way of life is the way we make our living. We bring life into this world; we watch our crops, our animals and our babies grow; we feed our families and we feed our neighbors near and far; we face loss and misfortune and the wrath of markets and Mother Nature; and we we have this legacy and heritage behind us as we build towards the future…and we do all of that somedays before the sun is even up. That’s the best thing about farming, that it is everything a life needs. It is everything I need. We grow the corn and grass that feeds our dairy cows, produce fresh, local milk and raise the next generation of farmers and kids here on our family farm with 3 generations working side by side. Our family farm cares for 3,400 dairy cows & calves and milks 1,600 of them every day producing 17,000 gallons of milk a day. To keep our animals well fed we raise 1,800 acres of corn and 3,000 acres of grass & hay. Every farm is unique, just like every family is…our family farm, on the surface and at first glance, may seem quite large (for New England) but if you give it a second look, or if you hang out in the parlor, the field, or even the farmyard, you will notice that we have 3 generations of family here, 6 families and 22 family members. 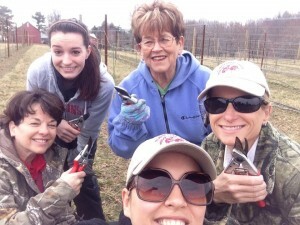 From toddlers to a few well beyond the age of retirement (farmers NEVER retire). From a 3 year old in the parlor helping his mom, dad and granddad milk to the 14 year old driving dump cart alongside his grandmother’s chopper to the 17 year old young man working before school with his dad we are, in every manner and meaning of the words a family farm. Family working side by side and generations leading generations isn’t unique for a farm but it’s not what one would expect on our farm if they didn’t take the time to take a look and if, instead, they looked at the numbers and the stereotypes and mis-information that others would have them believe about large farms. What makes us unique is that we put “family” in the “family farm”despite being a large farm… but really, we’re not unique at all, we’re just like 98% of all the farms in the U.S.
What is the best thing about farming? The best thing about farming is that our way of life – our special, close to the Earth, hard from the start but rewarding in every way, hardly ever the easiest but rarely anything less than the sweetest way of life, is the way we make our living. We bring life into this world, we watch our crops, our animals and our babies grow, we feed our families and we feed our neighbors near and far, we face loss and misfortune and the wrath of markets and Mother Nature, and we we have this legacy and heritage behind us as we build towards the future…and we do all of that somedays before the sun is even up. That’s the best thing about farming, that it is everything a life needs. Shelby Watson’s family has a vineyard where they currently grow 5 varieties of wine grapes: Merlot, Chambourcin, Vidal Blanc, Cabernet Franc, and Chardonel. They will be adding Sauvignon Blanc to the vineyard next year and have plans for a farm winery underway They have some livestock (horses, sheep, & chickens) and have converted one of our older horse stables into a wedding barn. All of that makes me wanto to get myself to Brandywine, Maryland! I believe our farm is unique because of the history we have had through the years of different types of agricultural production on the farm. Over the last several decades, our farm has transitioned a few times with the changing economy. While my grandparents started the farm as a hog and tobacco operation, they later transitioned into the large tree & shrub nursery business. We have also always had livestock and other small crops on the farm, so from the 1970’s – 2005 we had a Fall Harvest Festival that we opened to the public and local schools for tours of the farm. Thousands of people came through the farm each year to take a hayride, pick a pumpkin and see how animals are raised and crops grown. This was my first experience with advocating for agriculture! Recently, we experienced some family and estate changes and my aunt, along with myself and my husband, took over operations and again changed industries. After a lot of research and discussion with the agricultural experts in our area, we decided to enter the vineyard and winery business. We planted 1800 grape vines in April 2014, and are adding another 350 vines this year. We are about a year and a half away from opening our farm winery. We also cleaned out and spruced up one of our horse stables to become an events venue where we can host weddings, picnics, and other events. At one point during the height of our tree nursery business we had over 30 full time employees, however at this point in the new venture the farm cannot yet afford to support salaries, so my husband and I both have full time off the farm jobs to keep the bills paid. We are very lucky that my aunt is able to work full time at the farm, and she is the backbone of the operation that keeps us all straight! However we are excited about what the future brings and are certain that the investment and hard work is going to pay off! In my opinion the best thing about farming is working with your family on the family farm, pouring your blood, sweat and tears into something that you really believe in and care about. There are 18 of us that live on the farm property, and our entire family (including my 78 year old grandmother!) comes out to help during planting, pruning, and harvesting. We’re so lucky and blessed to be able to continue to work the farm and keep it in the family. THAT is what makes the long days and nights worth it. 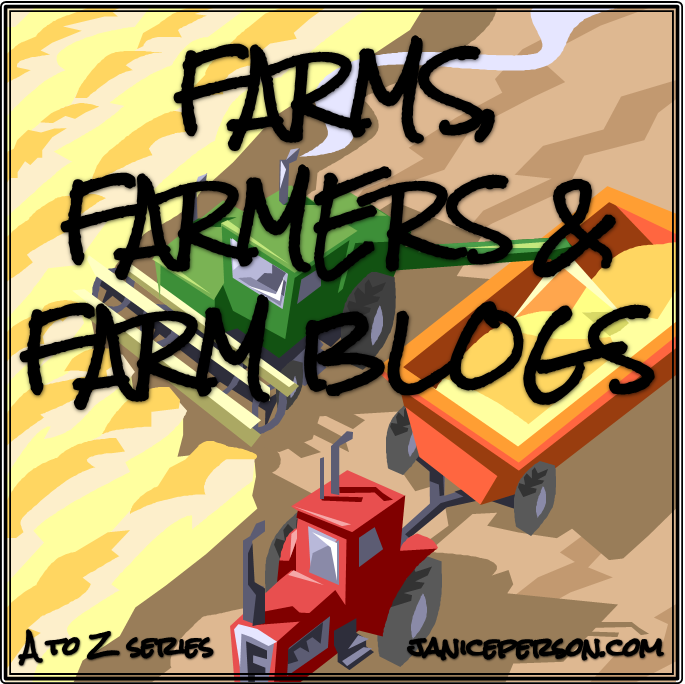 I am so jazzed about the number of women rocking farms in this Farms, Farmers and Farm Blogs in this A to Z series. And today’s post focusing on farms in Maine and Maryland shows this is a lot more than the flyover states! Tomorrow is the letter U… I bet some of you know where that is headed!